It's hard being an R these days. You have to believe in a lot of weird stuff. You have to believe that the world is 6,000 years old, that violated women can willfully keep from getting pregnant, that the system of health care that came from one of your own think tanks can't possibly work, that making rich people richer makes everyone else richer too, that black is white, and up is down. But the most unfortunate belief you must have to be a Republican these days is to believe that Climate Change is a hoax, that there is debate about the science, that the jury is still out, that God will protect us. To back up your belief, you must recite that the earth has actually been cooling since 1998, one of the hottest years on record. Here is the story on that from the radical USA TODAY. All of the top 10 warmest years on record have occurred since 1998. Australia recorded its warmest year on record, while both Japan and South Korea endured their hottest summers on record. While most of the world had warmer-than-average year, some areas were cooler than average last year, Karl said, including parts of the central USA, which was the only land area where that occurred. As for sea ice, while the Arctic had its sixth-smallest extent on record, sea ice was the largest on record in Antarctica. Sea ice records go back to 1979. NASA, using different methods of analyzing temperature data than NOAA, reported Tuesday that 2013 tied as seventh-warmest year on record." Each of the last three decades has been successively warmer at the Earth’s surface than any preceding decade since 1850 . In the Northern Hemisphere, 1983–2012 was likely the warmest 30-year period of the last 1400 years. But in all fairness, there has been a small decline in the warming in the last little bit. Some scientists think the warming of the air has continued but because much of it is happening in the far north, where warming has accelerated and stations are few, the warming is not counted adequately. Others think that the oceans have begun to take on the heat. Fact is, the oceans have always taken on the lion's share of the heat. Global ocean temperatures rose dramatically last year, providing another strong sign that the oft-cited global warming "pause" or "hiatus" since 2000 has happened only at the surface – while the rest of the planet has been heating up at an increasingly rapid pace. As you'll see at the left side of the chart, the ocean's heat is measured in joules, a unit of energy. Over the past 55 years, the global ocean has warmed at a rate of about 136 trillion joules per second, a pace that's been compared to the amount of energy released by two Hiroshima atomic bombs – every second. In more recent years, that pace has quickened to about 250 trillion joules per second, or roughly four atomic bombs per second. And in 2013, that pace accelerated even more, roughly tripling to about 12 atomic bombs per second. 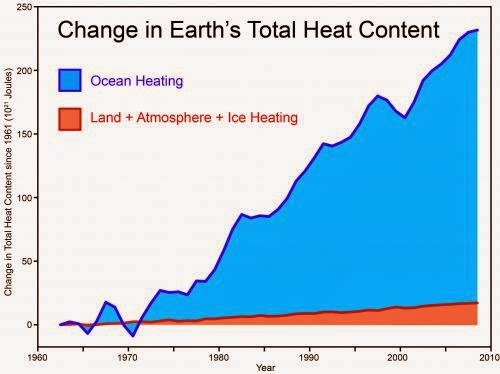 This is significant because, as the Intergovernmental Panel on Climate Change notes in its 2013 report, the world's oceans are absorbing more than 90 percent of the rise in heat stored by the climate system over the past few decades – far more than land, ice, or the atmosphere, which stores only about 2 percent of the excess heat. That means that global average surface temperature measurements, which have showed a slowdown in warming since about 2000, are just one indicator of how much and how quickly the planet is warming. As the IPCC points out, there are a slew of other measurements – like the increasingly rapid melting of the world's glacial ice, Arctic sea ice and the Greenland ice sheet – that demonstrate how misleading that one indicator can be if we look at it in isolation." Someday it will be even harder to be a Republican. It's one thing to hold onto a fairy tale about the age of the earth and the universe that surrounds it. Nobody gets hurt too bad. You can even argue that trickle down economics might possibly work, even though we know better. The result is further distance between the top and bottom among us. But when the R's deny climate change, they are engaging in a reckless endangerment of our species that will not be well regarded in the not-so-distant horizon. Their trials will be short. Their punishments will be long. Best not to be a Young Republican.